Haven't fulfilled my quota of giggles today, so I must inquire whether the local Rho Beta Sigma (PBS) Downton sorority is looking for NPC affiliation? A Downton campus would be more likely to attract chapters than the Downtown campus is! I hate to update the list this way, but I can't see another way around it. *University of California-Merced - Delta Phi Epsilon, Delta Zeta, and Phi Mu presenting. Phi Mu invited to colonize, Spring '16. Delta Phi Epsilon invited to colonize, Spring '18. 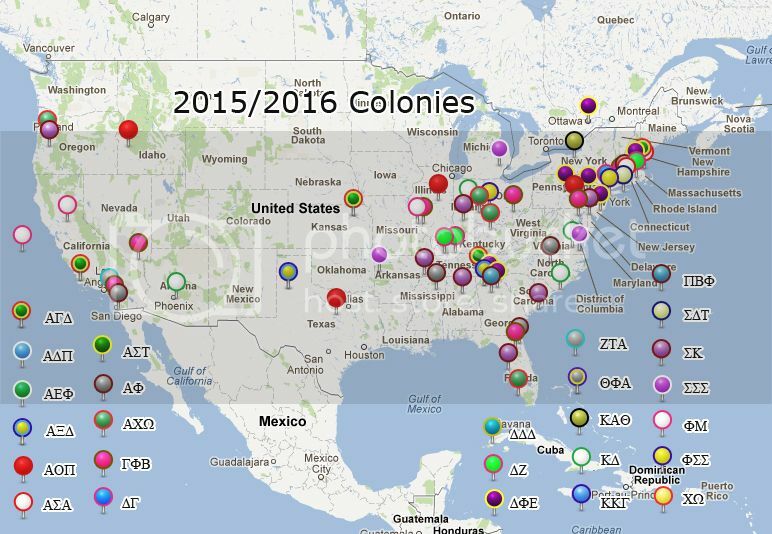 Pi Lambda Phi invited to colonize, Spring '16. *University of Delaware- Alpha Omicron Pi, Delta Delta Delta, and Pi Beta Phi presenting. Pi Beta Phi invited to colonize, Spring '16. Delta Delta Delta invited to colonize, Spring '18. *Centre College- Alpha Sigma Alpha, Kappa Delta, and Phi Mu presenting. *Towson University- Alpha Delta Pi, Delta Phi Epsilon, and Sigma Delta Tau presenting. Delta Phi Epsilon invited to colonize, Spring '16. *Hartwick College- Theta Phi Alpha presenting. Theta Phi Alpha invited to colonize. *Wittenberg University- Alpha Xi Delta, Delta Zeta, and Kappa Kappa Gamma presenting. Alpha Xi Delta invited to recolonize, Spring '16. *University of South Carolina-Beaufort- Alpha Gamma Delta, Alpha Omicron Pi, and Phi Mu presenting. Phi Mu invited to colonize, Spring '16. Alpha Gamma Delta invited to colonize, '17-'18 (TBD). *University of Puget Sound- Alpha Gamma Delta, Delta Delta Delta, and Phi Mu presenting.